In South Africa, men view depression as a sign of weakness. So when veteran journalist Marion Scher wrote a story on the topic for the South African magazine Men's Health, she was thrilled that the men she interviewed allowed her to use their real names. "That's very, very unusu­al," Scher said. "They really bared their souls to me." Her article also provided contact information for the South African Depression and Anxiety Support Group, and, once the article was published, the organization's phones began to ring with men looking for help. Some even called Scher personally. "They asked if I could put them in touch with the men in the story," she said. Scher wrote the depression article, plus several others on suicide, childhood depression, and general anxiety disorders, under the auspices of the Rosalynn Carter Fellowships for Mental Health Journalism. Scher was one of two journalists from South Africa who received fellowships for 2005–2006. The class also included two New Zealand and six U.S. journalists. The Carter Center fellowship program trains a cadre of journalists in mental health reporting each year. By providing financial support and mentors, the program aims to increase the visibility of mental health issues in the media and reduce stigma about mental illnesses. While Sher was helping South Africans with depression see that they were not alone, Michelle Trudeau, a correspondent for National Public Radio, reported on current research in mental health. One of her most memorable stories focused on aggression in school-age children. A study showed that acting aggressively was a coping mechanism for many children who had major stresses at home. Trudeau reported that many of these students simply are kicked out of school without any in-depth diagnosis and evaluation. "This was an effort to show that if we can get to the underlying problems, then we can help with intervention and treatment," she said. Trudeau found the members of the Center's fellowship advisory board to be a resource for her work. "I could shoot off an e-mail saying, 'I'm looking for an expert on X or Y' and have four or five different people respond to me immediately with good suggestions," she said. She added that she plans to continue calling on the Carter Center's board of experts in her future work. For Chicago television producer Julianne Hill, her affiliation with the Center and former First Lady Rosalynn Carter opened doors. "Mrs. Carter's mission to reduce stigma of mental illness really helped convince people that this was a safe place to tell their stories," Hill said. "This was a place where they were going to be heard," she added. "Mrs. Carter is inspirational to reporters," Trudeau said. "We have really benefited by being exposed to her passion and her intelligence." In September, the 2005 – 2006 class formally finished their year as Carter Center fellows, and the program welcomed another 10 journalists to the program. But the outgoing fellows go back to their newsrooms with a new perspective on and sensitivity to mental health. "The fellowship experience reminded me that the most important story about mental health is the personal story-the story that touches people who are suffering with mental illnesses and their families and their communities," Hill said. 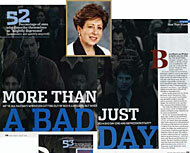 This article originally appeared in the Fall 2006 issue of the Carter Center News. with many readers in South Africa. University of Hartford at a meeting for journalists who have received a Rosalynn Carter Fellowship for Mental Health Journalism.